Why are some liberals misrepresenting the debate and claiming corporations have First Amendment rights? Chick-Fil-A’s financial support to anti-gay causes has gone on for years with little commotion outside the LGBT activist community. But that changed earlier this month when Dan Cathy, CEO of the fast food chain, told the Baptist Press that he is “guilty as charged” for pushing the company to take a stand in the national debate over marriage equality. Those comments set off a backlash—including boycotts, protests and politicians’ denouncing Chick-Fil-A. In Chicago and Boston, the mayors of each city fired off statements claiming the chicken sandwich joint is no longer welcome in town. The backlash, like any charged political debate, is now setting off its own backlash. If the activist-led uprising against Chick-Fil-A were simply about the CEO’s views, I would agree with these comments. The debate, however, centers around how Chick-Fil-A and its business affiliates spend direct direct corporate cash on supporting anti-gay causes. If a corporation uses its general treasury funds to finance political advocacy, does that mean any politician that takes action against that corporation in response to that advocacy is violating the First Amendment? It’s a question that comes down to whether you believe corporations have rights akin to human beings. “You can’t have a business in the City of Boston that discriminates against a population,” said Boston Mayor Tom Menino in an interview with local press. He’s since walked back these comments after a storm of critics alleged that Menino was discriminating against a company based on the political beliefs of its CEO. But in this case, corporate profits derived from selling chicken sandwiches and waffle fries are being funneled to media and lobbying campaigns against gay Americans. Mayor Menino had a point. 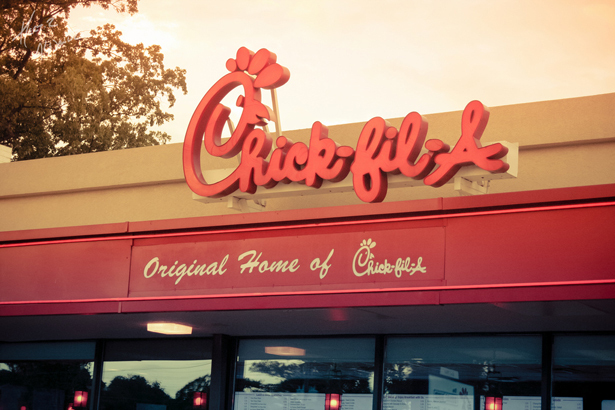 Liberal defenders of Chick-Fil-A are quick to claim that an official ban would set a dangerous precedent that would amount to a chill on the First Amendment. But what about corporations that unload their corporate coffers bribing politicians, funding dark money political campaigns, busting unions, or other efforts to discriminate against minority populations—Latino immigrants, Muslim Americans, etc. Isn’t the decision to ignore how corporate money is spent setting a dangerous precedent? Earlier today, I wrote a post arguing that defenders of Chick-Fil-A are misrepresenting the recent controversy by claiming that the local governments threatening official action are violating the company’s First Amendment rights by acting solely on the views of Chick-Fil-A’s CEO. The defenders of Chick-Fil-A, and there are a good number across the ideological spectrum, claim government can’t take action against a corporation just for its CEO’s political beliefs—a position I certainly agree with, and made clear in my post. The corporation’s actions, not the CEO’s, are the problem. But my original point was that these Chick-Fil-A defenders missed the forest for the trees—the problem that LGBT activists have decried for years is that Chick-Fil-A uses its corporate profits to fund anti-gay media and lobbying campaigns, a fact well-documented by groups like Equality Matters. The CEO’s comments simply shed light on an issue that had been ignored by the mainstream press. So first off, I’m glad Greenwald, who posted a response later in the afternoon, is now engaging in the substantive debate about how the company uses its general treasury to lobby, rather than the relative sideshow about what Chick-Fil-A CEO Dan Cathy believes. How Chick-Fil-A uniquely uses its corporate coffers to fund discrimination advocacy is worth debate. As Jeremy Hooper reported, Chick-Fil-A’s corporate entity directly finances an anti-gay charity called the WinShape Foundation. As WinShape made clear in e-mails posted on Hooper’s blog, the foundation does “not accept homosexual couples because of the statement in our contract.” Franchise owners are often expected to attend WinShape gatherings. The foundation also funnels a great deal of money to other anti-gay advocacy groups using direct Chick-Fil-A company funds. Does the corporation’s deeply embedded links to WinShape, which appears almost as an appendage of the company rather than simply a political endeavor, also constitute discrimination? That’s the question. Also, let me make clear that I do believe that Mayors Menino and Emanuel acted out of haste and political expediency. Are they right to zone out a corporation by reflexively responding to news headlines? Absolutely not. I simply laid out part of the evidence that the Chick-Fil-A corporation acts directly to support discrimination, so when Menino said, “You can’t have a business in the City of Boston that discriminates against a population,” he had a point.